Delicious non-touristy options in Paris’ Montmartre neighborhood. Where to grab a bite in the quaint neighborhood of Montmartre in Paris! Anyone who knows me knows that Montmartre is one of my absolute favorite parts of Paris! The winding paved streets! The art galleries! The Sacre Coeur! THE FOOD! Like all over this wonderful city, Montmartre is crawling with restaurants and cafes just begging to be discovered. That being said – we know that all of the options can sometimes feel overwhelming! We’ve done the heavy work for you! 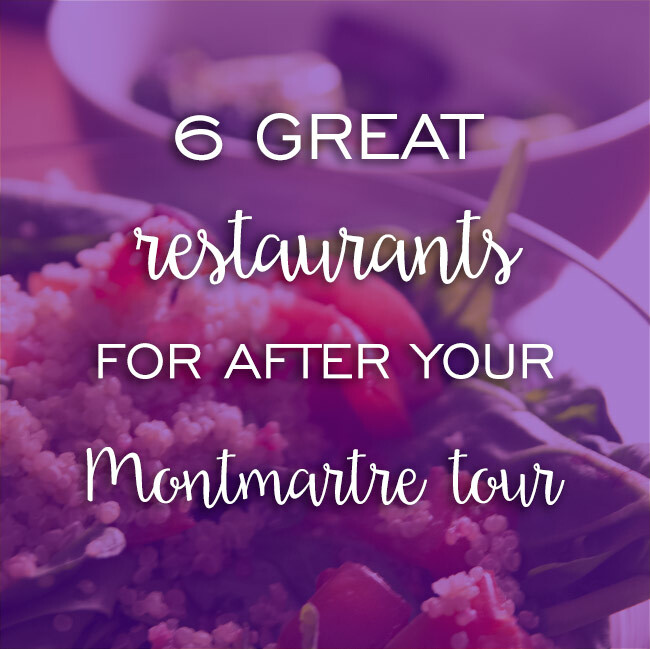 Here’s our 6 approved restaurants for after your Montmartre tour. A buzz with local Parisians, this restaurant serves simple and traditional French cuisine in a charming restaurant on a quaint street just around the corner from Sacre Coeur. The food may be simple, but that doesn’t mean it’s short on freshness or taste! Their wine list also changes weekly to keep things different…sign us up! Head here for a lovely way to spend the afternoon or evening in Montmartre. Le Miroir is known for its homestyle French cuisine, and is one of my favorites on the Butte Montmartre. Le Miroir is a modern bistro with quality food and a great wine list (they have a wine cave just across the street!). This close to the touristy part of Montmartre, a better price-quality deal is hard to find, with meals rounding out to between 20-40 euros per person! Head here if you want to feel like a local! Hidden in the winding streets behind Sacre Coeur is simply one of the greatest Italian restaurants in Paris. We know what you’re thinking…Italian in Paris?! Trust me on this one! My recommendation, the burrata! My colleague just took her mom and sister here for dinner and they were all blown away! A very local place, in a great up and coming neighborhood just at the base of Montmartre (South Pigalle). What is this place known for in Paris? Traditional cuisine made with fresh products that is accessible to everyone! The tuna steak was amazing, but honestly every dish was fabulous. A definite favorite. Vegans and vegetarians rejoice! We’ve found what I think is one of the best places for you in Montmartre. Head to this cozy resto to get your fill of the freshest fruits and vegetables – perfect for recharging after our Time Travel to Montmartre tour. Fill your plates and your bellies so you can get back out there for some more exploring! Weekend bonus? They do an amazing brunch! 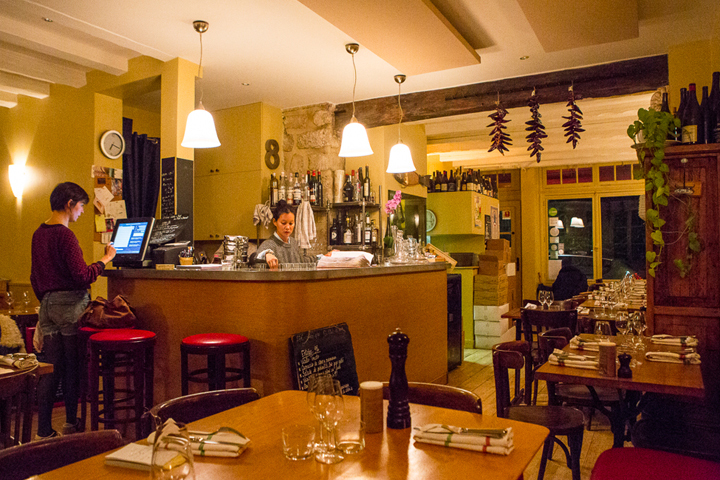 Located just a 10 minute walk from the Sacre Coeur, this French bistro is not only one of our teams favorites in Montmartre, but maybe in all of Paris! We’re partial to the risotto, but we swear that everything on the menu is mouth watering. Another bonus? The waitstaff is super friendly and speak excellent English! What more could you ask for? There you have it, Sight Seeker’s! As usual, let us know what you think of our round up in the comments below! Happy munching! Whether you’re in the Marais, checking out Notre Dame, or walking along the Seine, we’ve got your back! This entry was posted in Food & drink, Paris Activities, Restaurants & Cafes and tagged dinner, lunch, Montmartre. Bookmark the permalink. My mouth is already watering reading this yummy blog post. I appreciate the blogger for such an informative post.